YOU NEED THIS SYSTEM. PERIOD. Pure and simple … if you want the best grades, you have to remember more. Sometimes a lot more. If you think your memory has reached its limits, study too hard and remember too little, or are tired of not “knowing” the right answer at the right time, then you need a better system … THIS system. 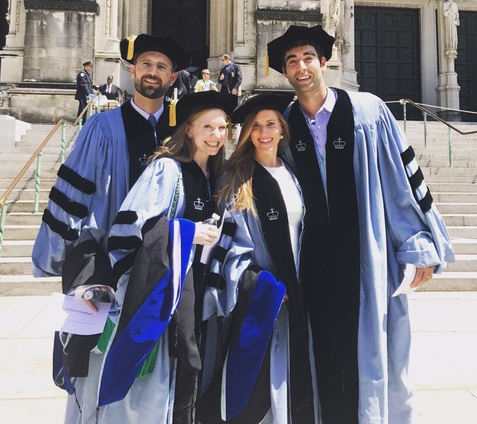 With personalized training and tailored 1-2-1 coaching from the world’s preeminent memory expert – Scott Bornstein, master 5 fail-proof MemoryPower Systems and killer accelerated learning/study habits & test-taking processes that will change your academic life. Scott will show you how to learn any subject in less time, with less effort – with amazing recall and results – like never before! Invaluable for students 12 and older! If knowing 10% – 50% more on tests, or if out-remembering, out-learning, and out-performing your classmates would make a difference to you, then master the most powerful, effective, and widely-used memory system & tools a student needs to have. Don’t spend thousands of dollars on tutors when what you really need are select systems & processes for learning and remembering … every subject, every time! If you can’t remember well it’s because you haven’t learned how. Contact us below to get started! LET'S TALK MEMORYPOWER FOR STUDENTS! You will be learning a NEW habit, a thoroughly foundational approach to studying, absorbing, and triggering the memory. You will be guided, step-by-step, in re-wiring your memory’s capabilities; a process that requires 4 Sunday sessions, across 4 weeks , to allow the skill to grow strong and your memory to act fast. You will have online practice to sharpen your new systems and reinforce recall accuracy. Special materials to develop focus and build a richer vocabulary (crucial to memory consolidation and learning), and mastery of the number system. 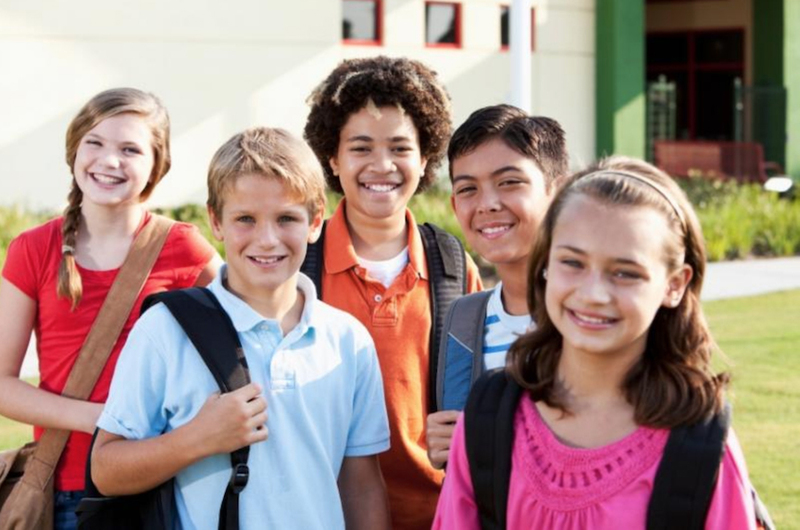 Through rich and varied examples across the spectrum of relevant academic content – terms, names, numbers, formulae, languages, concepts, reading comprehension, notes, lists, organization/study/test-prep – you master an air-tight process that guarantees rapid and lasting fluency; which, for many, is more than enough. Invaluable for students 12 and older! Each training lasts 4 weeks, is conducted personally by Scott Bornstein, limited to a maximum of 6 students to allow optimal interaction and learning, customized workshop materials, subscription to all online review/practice modules, 272 page Vocabulary Mastery book & 110 card deck of the master number/word system, Mind-Map worksheets and materials. You’re in training and I’m your personal MemoryPower trainer. Your guide with the neural/cognitive map that helps you find the shortest path to the best and easiest recall results. With more than 30 years experience in training students and professionals – law & medical school and college content, middle/high school subject matter, co-founder of an SAT/ACT/GRE/GMAT and teacher licensing test-prep company, chief Memory Training Expert to executives and sales professionals, memory trainer to older adults – I will save you time & effort, and guide you in conquering your memory challenges and hitting your academic targets and goals. Invaluable for students 12 and older! 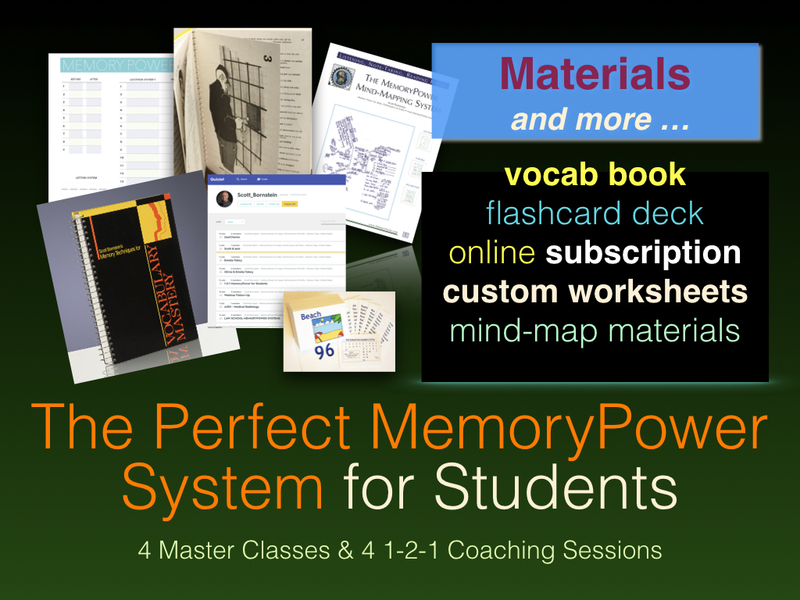 This is an ADD-ON to the 4 MasterClasses and precisely tuned to connect your newfound memory expertise and proficiency to your immediate and future subject-matter mastery needs.